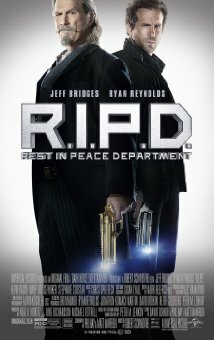 R.I.P.D. : A recently slain cop joins a team of undead police officers working for the Rest in Peace Department and tries to find the man who murdered him. It borrows some ideas from Men in Black, Ghost, and The Matrix and mixes them together in an eccentrically hokey framework that will repulse large segments of audiences, but R.I.P.D. is still one of the funnier films this year—one that dares to entertain in a most unusual effort. Few will consider it best of the year while many may pan it as the worst, but there is no denying that the film will leave its mark. Bridges continues to most welcomely lay on more of that "Rooster Cogburn" charm from True Grit, but the real sensation here is Mary-Louise Parker as "Proctor" who is pure gold. 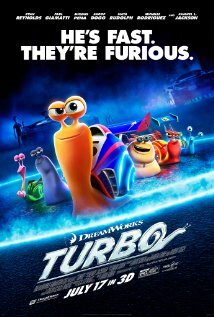 Possessing a sprightly creativity, Turbo is about a snail that, after an accident, can move at hundreds of miles per hour, thereby allowing him to fulfill his dream of racing in the Indy 500. Made especially for the kiddies (even the littlest ones will watch in angst) and full of wonderful messages, Turbo is one of the better films this year. 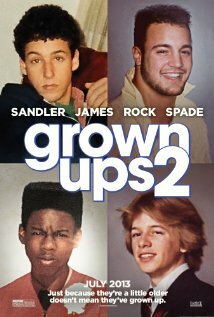 Grown Ups 2: After moving his family back to his hometown to be with his friends and their kids, Lenny finds out that between old bullies, new bullies, psycho bus drivers, drunk cops on skis, and 400 costumed party crashers, sometimes crazy follows you. It could be called an obnoxious waste of tape and time or it could be called a slightly more appealing sequel to the nasty, disgusting piece of trash known as the first Grown Ups. The styling in every way feels the same, but this one somehow seems less ridiculous, although that still isn’t saying much. Admission: A Princeton admissions officer who is up for a major promotion takes a professional risk after she meets a college-bound alternative school kid who just might be the son she gave up years ago in a secret adoption. Fey exhibits the same unlikable personality she usually does, but Rudd is on his game in a movie that does well enough what it needed to do to make it worth our time. It isn’t always as funny or as charming as it wants to be, but its unpredictable ability to play with our emotions and leave us touched is fully in tact. If ever a makeover was called for, it is here! Luhrmann’s Gatsby has the greatest respect for its predecessor, as well as the time in which the movie is shot. Although it is occasionally showy and bombastic, the impassioned performances give it great standing, even in light of the classic original. Maguire and DiCaprio are both at their best, and Edgerton isn’t too shabby.